Shock treatment, also called shocking or superchlorinating, is the process of adding enough sanitizing agent to a swimming pool to overwhelm any microorganisms in the water, killing or rendering their numbers small enough for safe swimming. Shock treatment, also called superchlorinating or shocking, is a process to oxidize and sanitize water, keeping it disinfected and visibly clear. The idea behind shocking a pool is to dramatically raise the sanitation level in the water, basically overwhelming any undesired contaminates in the water such as bacteria, viruses, mold, and algae growth. Although chlorine-based shock is most commonly used, non-chlorine based shock options exist. Potassium Peroxymonosulfate is a non-chlorine based shock which sanitizes the water without raising chlorine levels. Shocking swimming pool water is common and the recommended way to keep organic contaminates from taking hold in the pool water. Free chlorine level must be maintained at levels 10 ppm or greater. The chlorine strips the pool water of combined chlorine, also called chloramines, of any ammonia and causes the ammonia to form gas bubbles; rising up and out of the pool water. The oxidized materials are either completely destroyed, or what is left is filtered out through the pool filter, leaving the water clear and clean. The pool will be left with high concentrations of chlorine, at or above 10 ppm. Leaving the pool open in the sunlight will quickly reduce this chlorine level. Testing the pool water chlorine level is recommended after shocking the pool and letting the chlorine level drop after about two hours. Some sources recommend weekly shock treatments, although chlorine levels should first be tested to determine how much shock product to add. 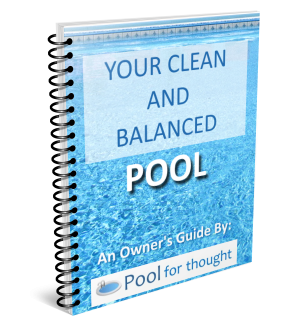 If no combined chlorine exists, which means free chlorine and total chlorine are equal values and between 1-3 ppm, then there is no need to shock the pool.